Daily Illuminator: Experience The Magic Of The City! August 26, 2013: Experience The Magic Of The City! Cities are pretty fantastic if you stop to think about them. 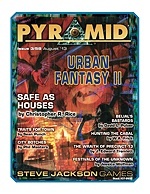 We take that association one step further with Pyramid #3/58: Urban Fantasy II, the latest issue of Pyramid. It's designed to appeal to fans of fantastic cities of any era, whether a medieval hamlet or a modern metropolis. This issue includes: a look at city-based abilities for GURPS Dungeon Fantasy heroes, written by Sean Punch (that line's Mayor for Life); a system for keeping supernatural dangers from threatening the spots where humans dwell; and a campaign idea that pits GURPS Monster Hunters heroes against the titular fiendish group from GURPS Cabal. Pyramid #3/58 also provides a system for generating new holidays (always a good excuse for city folks to take the day off), David L. Pulver's fiendish motorcycle gang who controls a town, a bad cop who now serves as a greater threat in death, and more. No matter whether your mystical municipality dwells in the past or present, Urban Fantasy II has something to ensorcel your senses. Pick up this issue individually, or start your subscription today and begin your magical journey with Pyramid!